If you are looking for an eye-catching bar as the centre piece for your private function, commercial event or for corporate entertainment, our mobile German style Bavarian Bar certainly fits the bill. We can arrange for an alcoholic license where appropriate and we can supply the bar on a “wet hire” basis (fully stocked with wines/beers/spirits) and operated by our staff, or on a “dry hire” basis (un-stocked) where you stock it and operate it with your own staff. 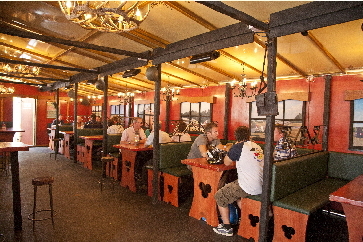 The Mobile Bar is an alpine chalet style unit in its generic form, themed to create a Bavarian ambience, with its shingle roof tiles, pine cladding and quaint “antler” lighting. We can also dress it up to suit your own event. We can adapt it for any specific theme including weddings, birthdays, Christmas, public holidays (eg. St Patrick’s Day) and sporting events etc. 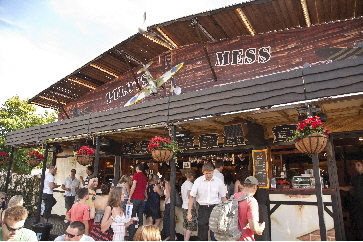 The pictures shown here are of the bar themed as “Pilots Mess” for an Air Show. In this aviation theme, the front gamble had specific signage applied and a revolving propeller attached, the staff wore WWII style uniforms and 1940’s military vehicles were parked outside to complete the picture. This high-capacity bar has a footprint of 40ft x 35ft (12.2m x 10.7m). It incorporates 60 indoor seats and standing room for approximately 40 people for all-weather entertainment of approximately 100 guests. 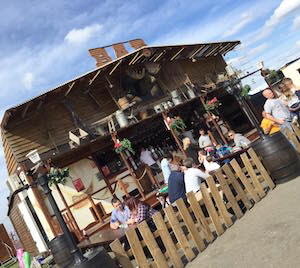 The bar can also be supplied with a fenced and gated outside “beer garden” area, which is approximately 80ft x 50ft (24.4m x 15.2m) with tables and chairs that match the bar. This area meets alcohol licensing laws and is suitable for up to 100 additional guests, bringing the bar/beer garden configuration capacity to 200+ people. We can increase this outdoor area should you need to entertain more people. The bar’s drinks dispensing capacity for beers, wines, spirits, soft drinks and hot beverages is designed to cope with this high volume of people to avoid any disappointed customers. Although the bar has a quaint feel to it, don’t be deceived, for the bar is fitted out to the highest standard and designed to impress with all the modern equipment you would expect in a hotel bar. It features controlled interior and exterior mood lighting, digital music and PA system and infra red heating for customers’ comfort in colder weather or night time operation. Behind the bar are two touch screen EPOS tills, three ceramic fonts with a total of nine beer taps, top quality beer coolers, pumps, ice makers, spirit optics, Gamco fridges, bottle fridges, a La Scala “Carmen” fresh coffee making machine, sinks and running water. For an amazingly quick and easy “in and out” the bar unit comes on a standard 40ft (12.2m) trailer which needs 16ft (4.9m) height clearance. It can be erected on a level site with clear access in under three hours from arriving and can be dismantled in a similar time. The beer garden element comes on a separate trailer and requires a fork-lift truck to unload it. This outside area can also be assembled and packed away in around three hours. The Bavarian Bar needs a mains power supply of 63Amps 50Hz 3Ph, a fresh water supply and access to a drain for waste water. Alternatively, we can hire you a whisper quiet generator and fresh/foul water tanks where these services are not available. 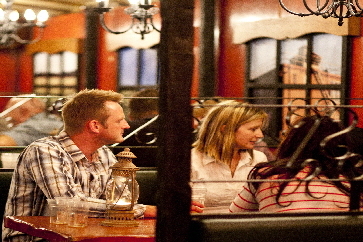 The Bavarian Bar meets all current HSE regulations for mobile entertainment equipment. It also complies with all food hygiene regulations. Guest capacity: Seated 60 persons, Standing 40 persons, total 100 persons.